﻿ 10 Best Practices when Interacting with Customers » Red Mango Marketing! You already know you’re dedicated to your brand, but how do you get customers to feel the same way? It starts with building positive experiences. Each time you interact with a customer or client, you want to establish a connection and build a meaningful relationship. This can be done in person, or automated with email marketing, but be sure to stay consistent with your customer interactions. Once you set your standard, you’ll have customers choosing you every time. Turn these ideas into powerful email marketing for your business. You’ve heard it before; that first impressions matter. If you’re looking to make a good first impression with your customers then a good place to start is with a strong handshake. There’s no doubt that cell phones are a part of our modern life, but should they be a part of important business meetings? According to a Pew Research study, most Americans don’t think so. The study found that 94% of Americans agreed that it’s not ok to use your phone during a meeting. Missing important details that will impact your customer relationship down the road. Your customers thinking you’re rude and unengaged. Your customers thinking you have more important conversations than the one with them. Your customers losing respect for you and potentially seeking others to work with. Show gratitude for all your customers. Apologize for any problems, issues, or hold ups. Relate to customers’ situations and put yourself in their shoes. Gathering feedback shows you care and want to continue to make your customers have the best experience possible. Give them insight into why you’re putting them on hold. People are a lot more understanding when you communicate why something is happening. Get their contact information and offer to call them back quickly. This shows that you’re invested in helping them. Track how long they’re on hold. Customers should not be on hold for more than a few minutes. As you respond to your customers and clients, you’ll also receive valuable feedback that can help your business grow. Use language that is relatable and conversational. Stay away from any formal language. Show appreciation for their comments, concerns and suggestions. You should even show appreciation for any negative comments. These should be treated like learning points to improve your small business. If you have customers that feel upset with any hold ups or issues, be sure to follow through with results. You can also follow up afterwards to ensure they’re completely satisfied. Your goal is to establish real relationships with your customers. Avoid outsourcing your customer service or support staff. Using an in-house support staff will allow your customers to connect to your employees easier and get to know them. Give clients or customers a specific contact point in your company. When you do so, give them that employee’s direct contact information. That way if they have any questions or need help they have a direct contact. They won’t have to look up any information. Listen carefully. It’s important that you take note of every detail so you can tailor a solution that fits your customer or client perfectly. Outline the problem. Work together with your customer or client to make sure you understand the problem completely. Have them help make the outline with you. Present a variety of solutions. Let them weigh in and choose the solution that fits them best. Stay open minded to any changes or modifications they may offer to the solution. You’ve done your job successfully when your customer leaves feeling like their issues were heard and they’re taken care of. This helps ensure they will work with you again in the future. We all like to feel appreciated. Saying a simple “thank you” to your customers lets them know that you appreciate and value their relationship. It also ensures that your customers know their business is valued. 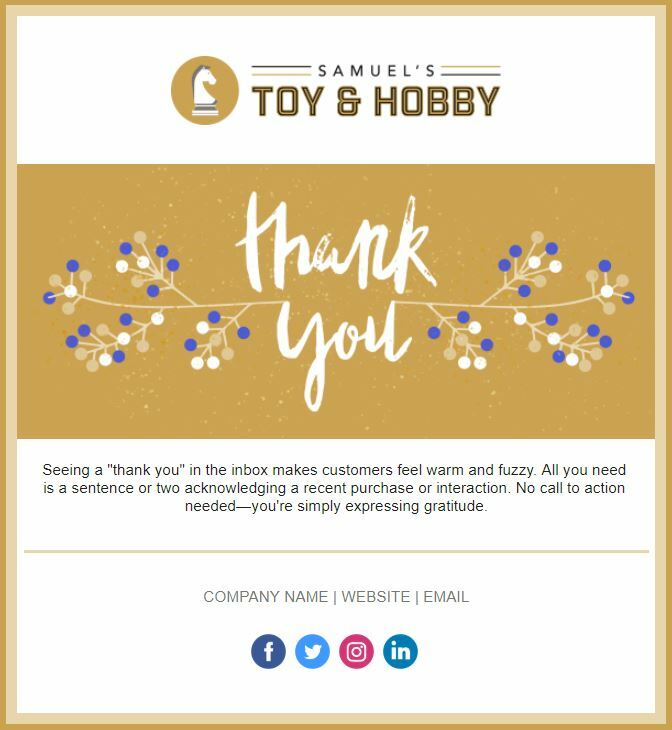 With email marketing, you can create professional-looking, personalized thank you emails that will not only leave a great impression, but allow your customers to connect with you on social media and know how to reach you if they need any further assistance. When your customers have a positive experience and feel valued, they’re more likely to recommend your business to others. This helps your business grow. Loyal customers support a business through both good and bad times. For those customers that continue to buy your products or services, you can reward them in a few ways. These not only serve as a reward system but can increase loyalty even more. If loyalty programs aren’t something you’re interested in you can also send reward gifts by mail. For instance, some companies send gift baskets to customers each time they refer another customer to you. The holidays are a perfect time to spread your appreciation and holiday spirit to your customers. One way to do so is by sending a holiday card to them directly. These cards help build, maintain and keep customer relationships. Holiday cards also offer you a way to reconnect with your customers who haven’t been active in a while. Sending a card helps show that you value them as a customer. You can also use the card to highlight how well your business relationship has done throughout the year. This can help motivate them to continue to work together in the upcoming year. Automating this process is easy with email marketing. Constant Contact offers beautiful email templates for many holidays, and allows you to send personal and timely communications to let your customers know you care. Some of these tips may seem like common sense, but it is important to set a standard when interacting with customers. Use the tips above to create your own guidelines on customer interaction based on what you believe is important for your customers and your business. Make sure you share these guidelines across the business so everyone is on the same page. This way, your customers will receive a consistent experience when working with you and your team. Establishing a strong relationship with each customer that comes your way doesn’t have to seem daunting. All you need to do is prioritize their needs and create positive interactions every time. The post 10 Best Practices when Interacting with Customers appeared first on Constant Contact Blogs. This entry was posted on Friday, April 12th, 2019 at 8:00 am	and is filed under Business Tips, News & Updates. You can follow any responses to this entry through the RSS 2.0 feed. Both comments and pings are currently closed.